Courtesy of Martha Stewart of course. If you're having a Halloween party or just like to bake than you must try this recipe out. 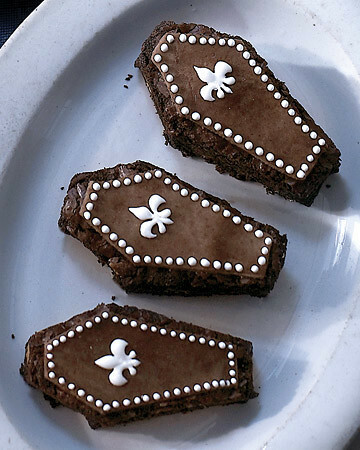 Not only does it sound yummy, but look how lovely these almond brownie coffins look. Strange to say that a coffin looks lovely but I gotta say that the fleur-de-lis and the dotted border really make it quite sweet, no? Usually, I don't share recipes since this isn't exactly a Foodie blog, but these coffins I thought were just too cool not to share. And plus, I feel that holidays are when you can get away with the unexpected. Maybe I'll share more Halloween recipes. Of course, they'd all be on the basis of visual aesthetic. What do you guys think about that?